A recent client engagement required us to assist an organisation from being an ‘also ran’ to a leading player in its designated market through a strategy execution and revitalisation process. The CEO was adamant before we started that he understood what the critical pivots were to take his organisation to the next level. In this blog, I share 3 of the critical levers or pivots required for successful strategy execution. Pivot 1. What is your game plan? Good Strategy comes first! Clarify your strategy so well so that there is no uncertainty as to what needs to be delivered, how this needs to be done, by whom, by when and how this will be measured. Probably the most critical ingredient in any strategy execution process is to have a business plan and related detailed action plans that clearly articulate where the company is heading to. 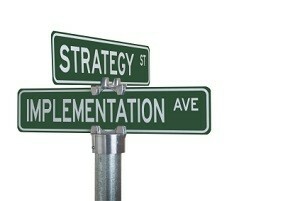 Beyond the mission statement and the business plan should be the vision. We can’t get to the destination, let alone get people excited to follow, if we don’t know where we are heading. Given the rate at which technology is advancing and the onslaught of competitors on a daily basis, no company can truly succeed if it has not got sight of exactly where it is right now vs. where it wants to be. I think one of the major challenges facing any CEO is simply this: do I know or do I need an independent insight and view as to where we really are as a company? How relevant is our value proposition? Have we got the right talent to deliver the strategy? Do we really have a business model that can compete? Can we still maintain our competitive edge and margins? What impact is technology having on our business model and what are we doing about it? In too many instances have I seen CEOs adopt the view that they don’t really need outside expertise and would rather just rely on their own company data and internal evaluations. Whichever path you choose, ensure that you have detailed action plans and action steps which can be driven by people in the company and assign responsibility to a specific individuals for accomplishing each of those action steps. This also requires you to firm-up exactly what numbers are to be delivered and the criteria for measuring them. Successful strategy execution process requires that the organisation communicate & cascade its strategy across the length and breadth of its personnel structure. Next is having key people in key places and successful strategy implementation is going to demand that the organization’s organisational structure can deliver the intended strategy. Organizations successful at strategy execution consider the human resource factor in making strategies happen. Further, they realize that the human resource issue is really a two part story. First, consideration of human resources requires that management think about the organization’s communication needs. That they articulate the strategies so that those charged with developing the corresponding action steps (tactics) fully understand the strategy they’re to implement. Organisations that have been successful at strategy implementation have done one thing better than most and it is simply this: they bring their best staff and talent to the best opportunities. For an effective strategy execution, responsibility and accountability must be clear. Without this clarification of roles and responsibilities for critical tasks and outcomes, you will have a tough time getting strategy implemented. Monitoring and controlling the plan includes a periodic look to see if you’re on course. It also includes consideration of options to get a strategy once derailed back on track. Remember, what gets measured, gets done and you need to be dedicated about tracking, reporting and taking timely actions based on key indicators of their business growth.